Venezuela, the jewel of South America, is being torn apart by the corruption within it. Venezuela is a country with many rich materials such as gold, diamonds, and oil. Though with all this potential to expand into a grand and successful country, Venezuela now suffers with corruption, riots, and poverty. “It was completely the government’s fault,” says Suncoast Senior, Jesus Lares, a native of Venezuela. When Hugo Chavez was elected as President of Venezuela in 1998, the country’s stability soon declined. Chavez was elected as President because the public was convinced he would ‘revolutionize’ Venezuela. Chavez began to give away free petroleum to foreign countries, nationalize private corporations, and steal the country’s money for personal uses. “It all basically boils down to Chavez’s socialist revolution,” claimed Lares. Chavez changed the rules of the presidency as well. Instead of keeping the law of a five-year presidential term, Chavez allowed for six-year terms as well as a limitless amount of reelections, giving him an extended period of time in office. When Chavez died in 2013, his trusted follower, Nicolás Maduro, carried on Chavez’s rules and corruption. The citizens attempt to stand up against the government by acting out in protests and riots, but it is hard due to the fact that the government contains a large military and that the people are weak and unarmed. “My cousin was protesting,” claimed Lares, “He got shot in the leg by a sniper just for protesting. 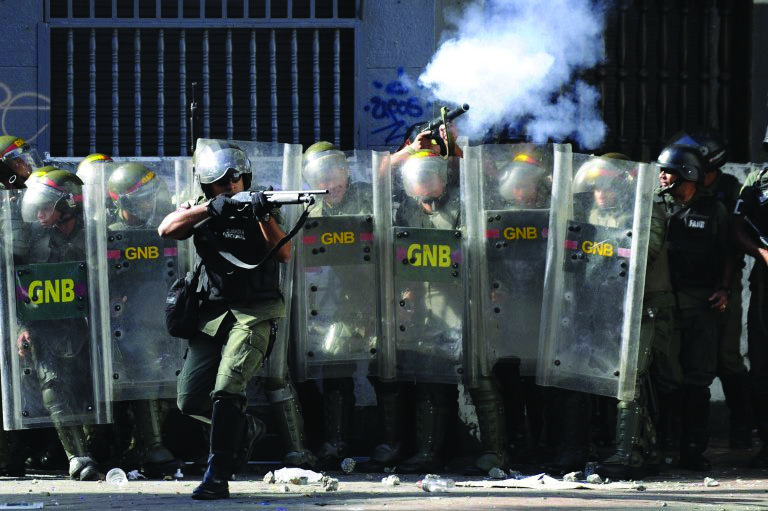 They just shoot random people.” The state of Venezuela is at a critical condition for the average citizen. Only time can tell if the protests will end in the favor of the government, or the people.